Am fiddling around with texture and sheep. Yesterday was round one. The other completed last night is doing some things that are amusing. Am planning on more experimentation with sheep and rooster heads. Kitty told me that the background cannot be as textured as seen in this noodle. More graphic... not sure. Insane patterning is fine by me. 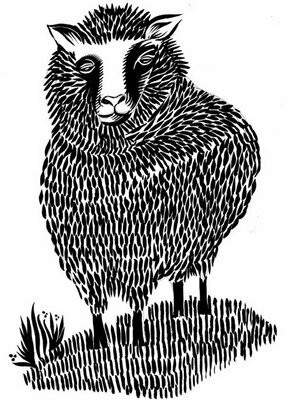 This lamb can be married with a lion (for a holiday card). Well, and speaking to Holiday cards, they are back on the plate again for one of my clients. • no obvious "holiday stuff"
Alex is playing golf in the rain. Kitty is making jewelry and watching tennis. I am getting them hitched up with a friend who needs cherry pickers for his cherry cordials that he brews with his still. Tall highschoolers are perfect for this thing. I am getting the company in the right spot (payroll etc.) prior to going to Hartford. Need to finish my Barnum picture.